There’s a lake in the middle of an old volcano… around the year 1780 this mountain exploded, spewing fire and ash miles and miles, and when the smoke settled a giant hole was left where the mountain once was. 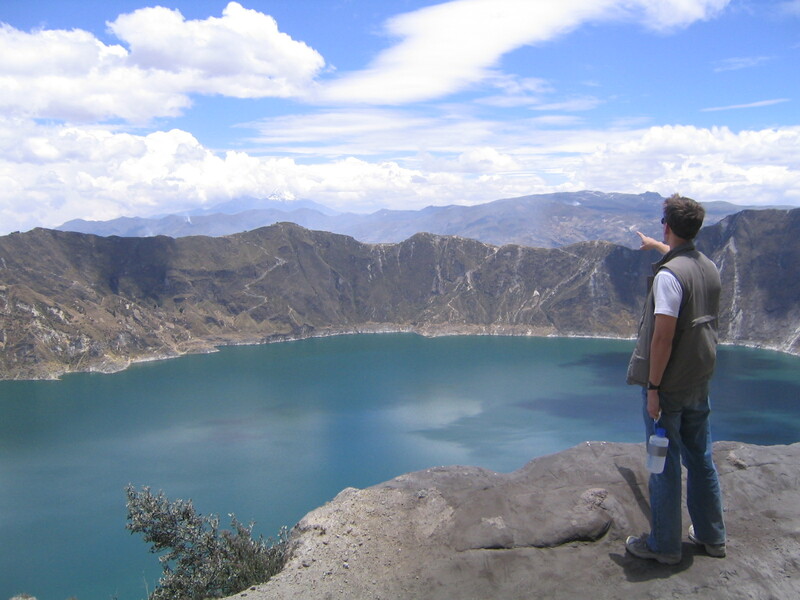 Over time the crater filled with water, forming what is now known as Laguna Quilotoa. This is one of the most spectacular things I’ve seen in my 24 years. We arrived at the summit of the crater before noon on Thursday. After negotiating our sleeping arrangements, we packed our day hiking gear and went to see for ourselves what we had heard so much about. And we weren’t disappointed. The 30-minute straight downhill slide to the bottom was a lot of fun. We hung out near the clear green water for a few hours, ate some frutas and cliff bars, wrote, meditated, and told the local burros (donkey) guides that we were planning on walking back up… Strangely enough, we met an older couple from Decatur there too- Bob and Janice we a nice bunch of gringos on a planned tour. They said that they weren’t so stupid to try and walk back up. Then for the next hour and 20 minutes we scrapped and dug our ways back up and out of the crater. That was our first major excertion… we took a nap shortly thereafter. Later that night we ate dinner with a local Quichua family huddeled around the wood stove heater- that was the best meal we had had yet on the trip. Afterwards we had a beer or two and chatted with one of the younger girls about their traditions, culture, the world, music, etc. in a mix of german, belgian, spain, and quichua spanish. That was a whole lot of fun. Sleeping that night, though, was a bit difficult due to the cold, the hard beds and pillows, and the weight of the 8 thick wool blankets that covered us. It gets chilly at night at over 12500 ft in the Andes. The following day, we started the long (er than expected) hike to the next town on the gringo trail- Chugchilan. Because our packs were much lighter, we hadn’t too much trouble staying on our feet… but we struggled a bit trying to find the trail. Local guides ripped out all the signs, as they seemed to want solo travelers to get lost. But with some luck, a lot of work, a gps, and the help a 8 year old boy we paid $1 to show us the way, we managed to find our way to a hostel some 5 and a half hours later. Now that hike kicked our asses. But it was worth it! Man, what a beautiful journey that was! Ah… I can’t even tell you. Maybe the pictures will help. I’ll upload them when I get a chance. We’re also looking into Amazon tours. So we may spend 3-4 nights in the jungle very soon.